We’re Past the Peak of Hurricane Season. Unless You Live in South Florida. October is no slouch when it comes to hurricanes. The most intense Atlantic hurricane on record formed in mid-October. Wilma became a hurricane on October 18th, 2005, over the Western Caribbean, and it became a Category 5 the next day. It intensified faster than any other Atlantic hurricane, dropping from 982 to 882 millibars in 24 hours, and sustained winds peaked at 185 mph. 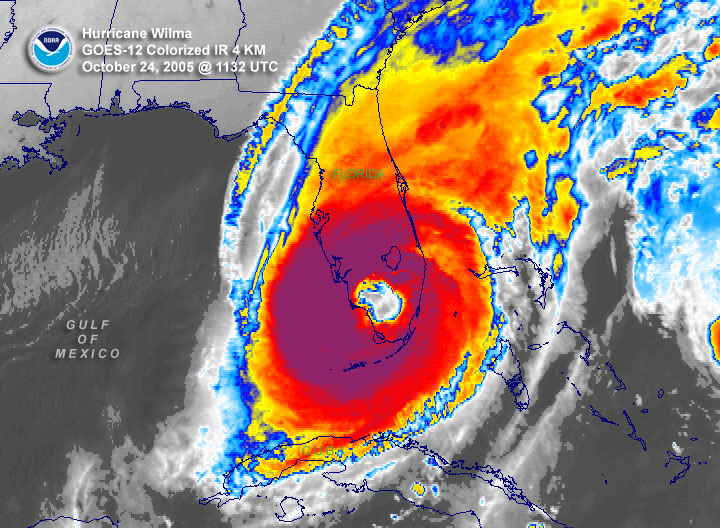 After raking Mexico’s Yucatan Peninsula, Wilma made landfall in southwest Florida on the 24th, as a Category 3 storm, and went on to cause more than $18 billion in damage in Miami-Dade, Broward and Palm Beach Counties. Countless buildings in South Florida had windows blown out, including the 14-story Broward County School Board building, below. 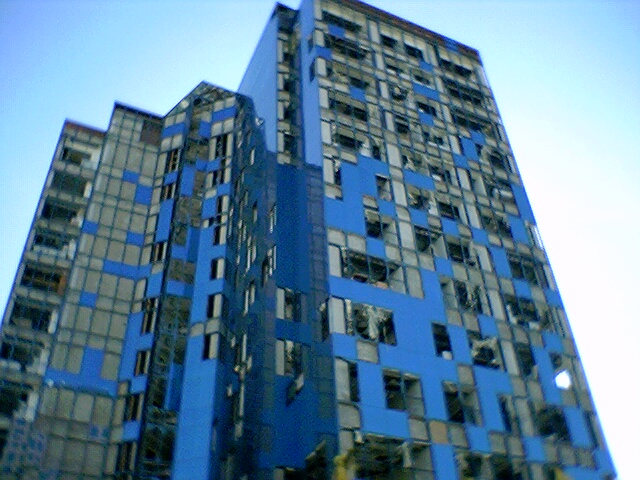 It was built prior to 1992, before post-Andrew building codes were enacted. The climatological, or statistical, peak of hurricane season in the Atlantic Basin is the 10th of September, but October is no time to relax. There have been many devastating October storms. And in South Florida, the hurricane risk actually increases in October. 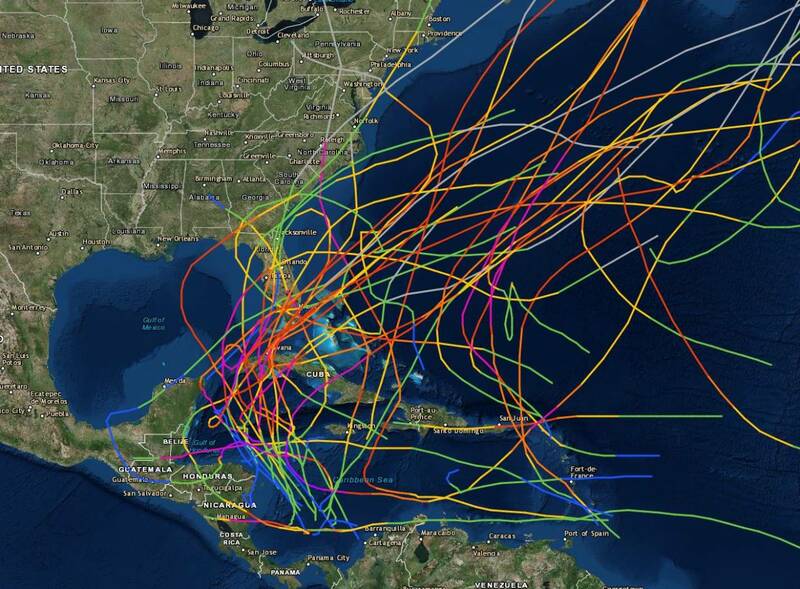 The graphic below shows all of the hurricanes in the record, going back to the mid-1800s, that have passed within 55 nautical miles of Miami in September. There were seven, including Betsy (1965) and David (1979). Notice the vectors in the tracks. All but one of the tracks show a westerly or northwesterly motion. These storms were born out of African Easterly Waves, which came across the central Atlantic. Now look at the map for October, with the same parameters, showing hurricanes that have passed within 55 nautical miles of Miami. We see a profound increase in the number of tracks, from seven to 17. Wilma was among those 17. And the October tracks are quite different; with a few exceptions, they show a north to northeasterly motion. Most of these storms developed in the western Caribbean, and were then picked up by strong southwesterly flow, ahead of cold fronts dropping into the Gulf of Mexico. The upshot here is clear—for those of you in South Florida, we’re entering what has historically been the riskiest time of the year for hurricanes. The points of origin and steering flow become more evident in this wide view of major hurricane tracks in October. Notice the historically lower risk of major hurricanes in the northwest Gulf—and the higher risk for all of Florida. 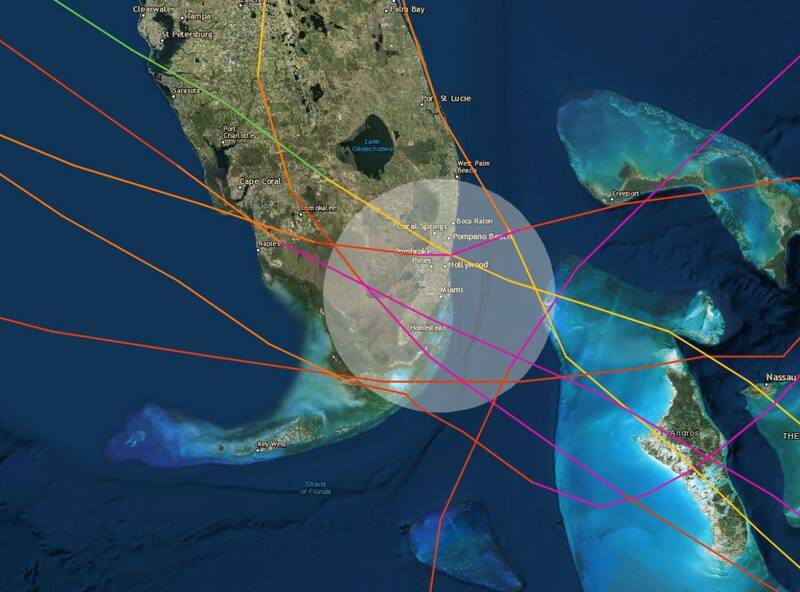 Of the 17 major hurricane landfalls in the U.S. in October, 10 were in Florida. An important caveat here is that these paths were determined by the climate of past decades. Historically, in October, fronts plunge well south and into the Gulf. But as the warm seasons of today get extended, early Fall cold fronts may not be as reliable. And areas that were typically beyond major hurricanes in October may not be as reliably so in the future. 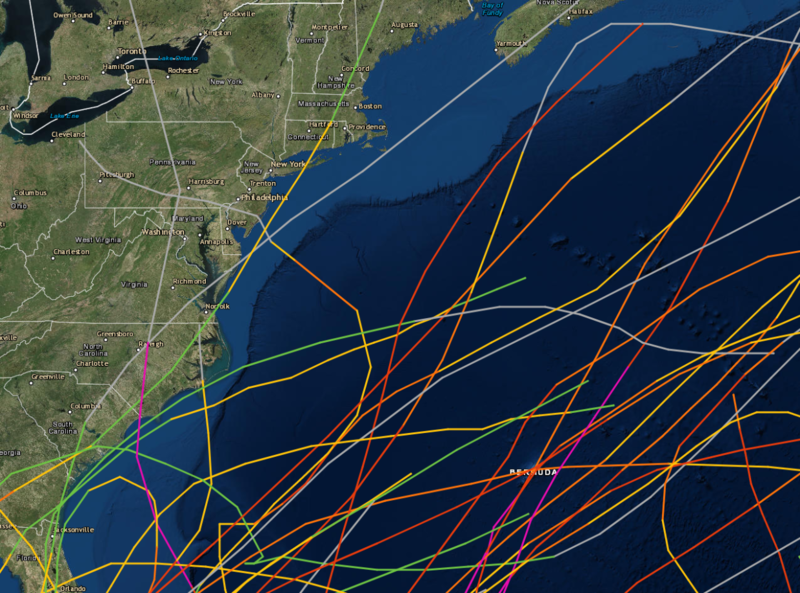 As we zoom in on the major hurricane tracks in October, we see that the majority were moving northeast—and were well offshore. Again, these paths were a function of the climate of past decades. Cold fronts and strong westerly upper winds would tend to keep major hurricanes out to sea. But there were notable exceptions, including Hazel (in pink), which clobbered North Carolina in 1954. Hazel killed nearly 100 in the U.S. and another 81 died in Canada, as the storm stalled near Toronto and raised rivers by 10- 30 feet. And the track that really stands out is the one that turns northwesterly, and drives right into the New Jersey. That was Hurricane Sandy in 2012, and for the first time in recorded history, an October storm that was well offshore turned left and slammed into the coast. When that turn first showed up in the models, it seemed almost unbelievable. The storm was driven by strong atmospheric block, a feature that is showing up more frequently. In a changing world, past hurricane tracks may become just a little less instructive. I remember hurricane Wilma. I was living in Fort Lauderdale at that time. Destructive storm.